ST. GEORGE — A truck rolled off state Route 14 in Iron County Thursday afternoon after a storm pelted the road with nearly three inches of hail. Utah Highway Patrol responded to the single-vehicle rollover involving a red pickup truck at 2:09 p.m. near mile marker 19 on SR-14. An 18-year-old woman driving the truck was the only person in the vehicle. 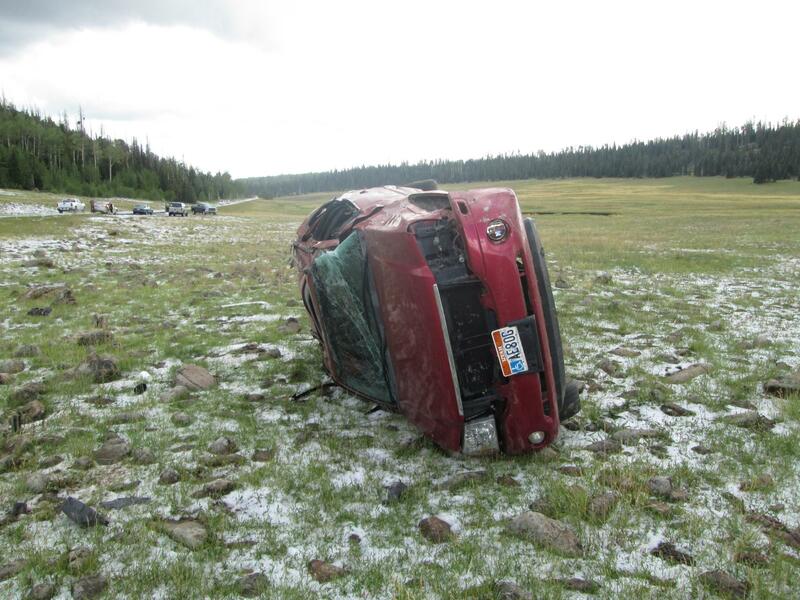 At the time of the rollover, the road was covered in slush as a result of the hailstorm, UHP Sgt. Nick Street said. The truck slipped off the road and rolled several times before coming to rest in a meadow. Medical personnel responded to the crash, but the woman did not require transport to the hospital. The rollover did not warrant issuing a citation to the driver, Street said, due to the “bizarre” weather conditions. 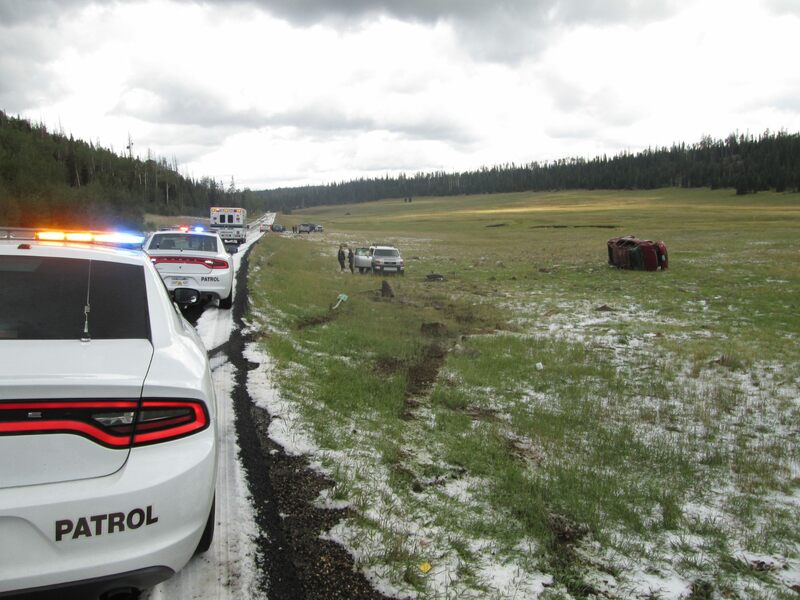 “Troopers said the squall left close to three inches of hail on this spot of the roadway,” Street said. The hailstorm was part of a large storm system moving through parts of Southern Utah Thursday, inundating roads and communities in Iron County and triggering a flash flood warning in Garfield and Kane counties. The vehicle rolled three times in a slush covered roadway, in the middle of a hail storm. How about unsafe speed for conditions? I’m with you. There is debris scattered for 50 yards. It’s obvious this driver was driving WAY to fast for existing conditions. Excessive speed is apparently not a big deal in Utah these days. Yabbut if they hurried, they would get out of the storm quicker??? Now don’t be starting an argument between the experienced older person (?) and the youngsters. They have far too much testosterone blocking good sense to be worthy opponents. Give them 30 or 40 years of experience then they can argue on our side. lynn, I noticed that too. 18 year old driving newer truck with handicap plates , rolls hundreds of feet off the highway….yeah, something else going on here.